WHEREAS, the Commissioners of the First Utility District of Knox Countyat its regular monthly meeting, November 22, 2016, deemed it necessary to increase the water and sewer rates and charges as noted. THEREFORE, be it resolved that the following rate and fee structures be effective with all bills and fees due on or after January 1, 2017. Water Service to other Utility Districts will be at contracted rates. A connection fee of $35.00 shall be charged to all customers when they apply for service. An additional service fee of $30.00 will be charged if service is to be turned on after 3:30 p.m. on the same day of sign-up. Charge for Water Spigot shall be $23.00. A meter check fee of $35.00 will be charged when a customer requests a check on the accuracy of the meter and the meter is found to be accurate. A water consumption audit fee of $35.00 will be charged when a customer requestsmore than two audits in a twelve month period. Net bill will apply if paid on or before date due shown on bill rendered. The gross, ten percent (10%) higher will apply if paid at a later date. A $20.00 service charge will be applied to all checks returned because of insufficient funds or a closed account. Fire sprinkler service connections with no water use shall be billed annually at the rate of eight (.08) cents per month per head. All sprinkler charges shall be billed to the owners of the buildings rather than the tenants. A charge of $31.70 per month per fire hydrant will be assessed to all customers with hydrants on private property. This billing shall be done annually. If bills are not paid within ten (10) days of the due date, service is subject to disconnection without further notice. Before service is restored, the total past due bill and the $25.00 reconnection charge must be paid. An additional fee of $30.00 will be charged when the turn-on is made after regular working hours. 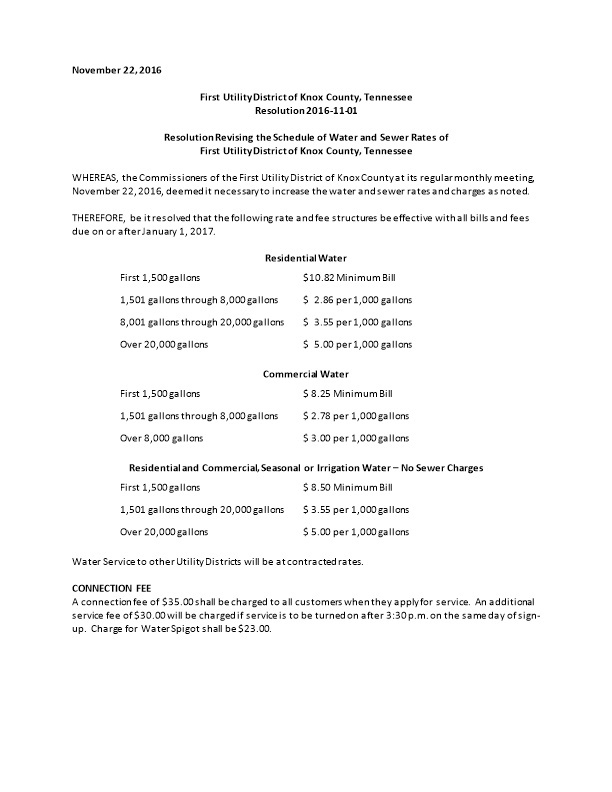 If the District discontinues water service for non-payment of a billing or any other reason, and the water is turned on without authority of the District, the District shall have the right to discontinue service, remove, or lock up the meter and charge a $25.00 reconnection charge. A trip fee of $25.00 will be charged to an account when a lock has been cut from a meter that has been turned off and locked by the District. The account will also be charged $10.00 to replace the lock. Reconnection charges of $25.00 shall be charged when the District reconnects or discontinues service for temporary repairs, and for other purposes for the customer's exclusive benefit. Backflow prevention devices will be tested and inspected annually as required by Tennessee State law. All backflow prevention devices shall be tested by a First Utility District representative. The District will charge a $50.00 fee per device tested. The maximum bill for residential wastewater service will be $67.08 per month. Commercial and Industrial users have no maximum bill. 7-35-201, whether or not an actual connection is made at that time. assessed on each connection to the sewer system served by a 5/8” x ¾” meter. when a connection is made. The above fees are due at the time water or sewer service is requested. All Residential customers who have wastewater service provided by a grinder pump system maintained by First Utility District will pay a $9.00 monthly fee in addition to the regular sewer bill at the rates then in effect. The Maximum Bill for these customers will also be $9.00 per month higher than the regular Maximum Bill. All Commercial customers who have wastewater service provided by a grinder pump system maintained by First Utility District, will, at all times, be charged a 10% higher rate than the current rate in effect on any billing date for wastewater services provided in any other manner than through a grinder pump system. Commercial customers have no maximum bill. Request for inspection of work not completed or otherwise not meeting District requirements and which result in additional trips to the work site by the District shall be paid at a rate of $50.00 per trip. Any person who shall continue any violation beyond the time limit stated in any notice of violation shall be disconnected from the District sewer system and from the District water distribution system and remain disconnected until violations cease, and a reconnection charge of $1,000.00 will be charged. The permit and inspection fee will be doubled for installing and backfilling a building’s sewer lines before obtaining a permit for connection or not having work inspected by the District and the expense of exposing the lines will be borne by the builder or owner. The wholesale rate charged for wastewater delivered to the District in the Ten Mile Drainage Basin under contracts with other governmental entities shall be $4.00 per thousand gallons. No customer shall supply water/sewer service to more than one (1) dwelling unit or business unit receiving water/sewer service from a single service line and meter without first obtaining written permission from the District. The billing for water and sewer services shall be to the customer in whose name the service is supplied through the single meter service and will be for the amount delivered. 5/8” x ¾” and more than one (1) business unit to be served through a single meter greater than 5/8” x ¾”, the amount of water used by all the dwelling units and business units served through a single service line and meter shall be allocated to each separate dwelling unit or business unit thus served by dividing the amount of water so used by the number of dwelling units or business units served. The water/sewer charge for each such dwelling unit or business unit thus served shall be computed just as if each such dwelling unit or business unit had received through a separately metered service the amount of water so allocated to it, such computation to be made at the District's applicable water/sewer rates, including the provisions as to minimum bills. The separate charges for each dwelling unit or business unit served through a single service line and meter shall then be added together, and the sum thereof, shall be billed to the customer in whose name the service is supplied. Charges for usage through a 5/8” x ¾” meter will be at standard rates, without regard to the number of units served. The Tennessee Department of Environment and Conservation Facility Maintenance Fees and Environmental Protection Fund Fees shall be passed on to First Utility District of Knox County customers on a pro-rata basis.